Today, I am sharing the results of my Wenzel 8 Person Klondike Tent review, a tent which garnered a pretty decent rating. Camping can be a stressful time; when you’re away from the comforts of home, it can be very difficult to relax. This stress seems to magnify greatly as the size of your camping party increases. One of the ways you can cut down on that stress is to have a simple strategy for putting as many people as possible under one canvas roof without stacking one person on top of another. Some large tents might have a larger “live in” area, but the large awning on the Klondike Tent give it the appearance of being larger than it is. The ability to put your camping supplies in an area that is not the place where you will sleep cannot be understated. And, in a pinch, this awning area could comfortably house two adults. The Klondike tent has a large amount of mesh ventilation surface area, which allows for more air to circulate through. This excess of ventilation is mostly due to the front awning, the walls of which are mostly mesh. Additionally, the door to the living space can be left open, allowing further ventilation to the tent’s interior. This is a major drawback with most large tents: many tents have only a few small windows and a mesh top to pass air through. One of the most interesting feature that I noticed on the Klondike tent was the existence of a rear mesh vent. This vent has an awning that feeds towards the ground such that it can be left open to allow air to pass through the tent even during rainstorms. The rear mesh vent won’t totally fix the problem of having a hot, clammy interior when the raindrops start to fall, but it’s a feature that will definitely help in some regard. Seeing as many tents don’t have any such feature, the rear mesh vent certainly sets the Klondike tent apart. One of the main concerns I have with the Klondike Tent is that there have been some concerns with durability. In my experience with this tent, the seams have been relatively easy to rip and the fiberglass poles are easily snapped. Durability is a valuable quality in a tent; you never know what will happen when camping! Despite these concerns, it is clear that this tent will be able to hold up in almost all weather except for high wind conditions. Be cautious and try to plan not to use this tent in mountain climates or when windstorms are expected. One of the things I dread most when camping with large groups is the act of setting up a large tent. The combination of a large amount of fabric and wildly crisscrossing tent poles can be enough to give you the headache of a lifetime. The Klondike Tent had no such issues. Setting up this tent was easy, thanks in part to the simple instructions included in the bag, as well as a carefully thought out assembly design. While the Klondike Tent is very large, calling it an eight person tent might be a bit of a stretch. Your camping party is unlikely to use the awning area as a space for people to sleep. Regardless, the awning area could be used as a secondary bedding area in a pinch, and the living area can easily and comfortably house four adults. Admittedly, there is a large amount of size inflation among tents so the size score isn’t affected too greatly. One thing that really helps this rating is the large amount of headroom present in the tent. The tent has a very high ceiling, which is a breath of fresh air over the usual “bend over and shuffle out the door” routine needed in some other tents. Overall, this will be a very cozy tent for you if you have a small family. It is crucial that your tent is waterproof. You certainly don’t want to wake up with a wet sleeping bag due to rain or morning dew, especially when it is cold outside. In this regard, the Klondike Tent is a strong performer. This tent has waterproof rain protectors that cover every mesh orifice, including the awning area. The seams are waterproof as well, though I did have some small leakage around the base of the tent after a rain storm. I am confident that if I had used a waterproofing spray on the seams, I wouldn’t have had any problems with water leakage in this tent. If you are looking for a summer tent, the Klondike Tent is perfectly suited to your needs. While some other tents tend to trap hot air and allow it to sit, the Klondike Tent has large amounts of mesh surface areas on its side and top. The rear mesh vent also allows the tent to stay partially open to air even during a rainstorm. A score of two out of ten is not surprising for this tent. It is advertised as a three season tent, with winter being the obviously excluded season. This tent was not made for a winter climate, and so you should not use it as such. There is virtually no insulation from the outdoors, and the large amounts of mesh openings allow too much air to pass through the tent during the winter months. When compared to the Coleman Montana, the Klondike Tent is comparable in areas such as ventilation and waterproofing. It seems that the Montana Tent has a lot more “bells and whistles” than does the Klondike Tent, including angled windows that keep out rain while open, a hinged door, and an electrical access port. As far as size is concerned, the Klondike Tent is much spacier than the Montana Tent. The Klondike can comfortably fit four to six campers, while the Montana Tent has some trouble fitting even four. If your camping group is more amenable to day camping, you might prefer the relative ease and simplicity of the Klondike tent. 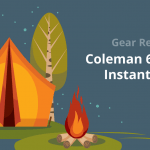 On the other hand, if you travel with a camping group that prefers longer adventures and doesn’t mind a tighter squeeze, you would likely prefer the Coleman Montana Tent. One of the advantages of the Camp King Tent over the Klondike tent is that the Camp King has a slight edge when it comes to being waterproof. The Camp King has a waterproof layer that drapes over the entire tent, which reduces the opportunity for leaks to appear in the tent at the seams. However, the fact that an entire layer must be draped over the tent means that an unsuspected night shower would be an incredible pain for a Camp King user. The best option for the Camp King Tent might be to leave the rain layer on at all times, which would trap air, and thus suit the Camp King Tent more for cooler climates. The lack of a covered awning makes setup easier for the Camp King Tent, which would make it ideal for you if you were novice camper. That being said, you would also have no issues setting up the Klondike Tent if you are a first-time camper. The Wenzel 8 Person Klondike Tent is a solid tent selection for a day trip style of camping. It suits most climates, and its closed in awning makes the tent feel much bigger than it actually is. Where many tents tend to cut corners on size by reducing height on the ends of the tent, the Klondike keeps roughly the same shape and height throughout. The Klondike’s major drawback are the concerns with the tent’s durability: it has trouble keeping its stability in high velocity winds. It would thus be perfect for you if you have a smaller family that plans to camp in a warmer climate, where the weather is known and predictable. Due to its ease of installation, you could use the tent regardless of your camping experience level. 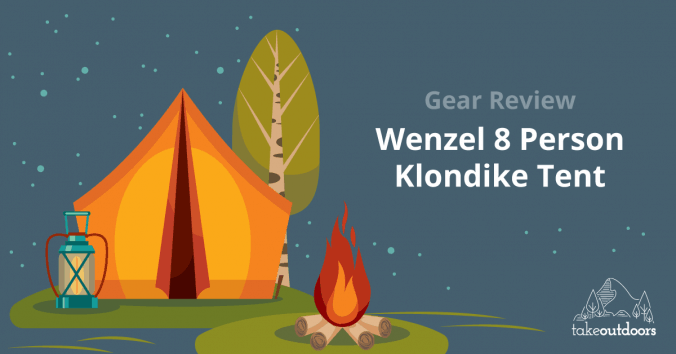 Based on all these factors, I would highly recommend the Wenzel 8 Person Klondike Tent for your next camping adventure.